AGAVOO is our videoconferencing services. We make videoconferencing easy and affordable. 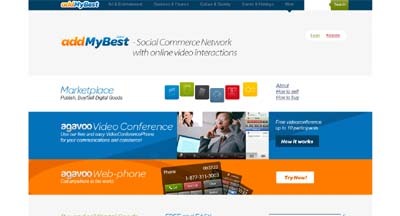 Our digital goods marketplace service AddMyBest is integrated with our Videoconferencing services. This permits sellers and buyers to easily connect, visually display digital goods, easily transact payments via our own payment system and receive delivery from a single source. We offer a Digital Goods marketplace combined with Videoconferencing. We may just be the only company doing this. A Google search on [“digital goods” videoconferencing] finds us prominent on the results first page. These results are achieved without any SEO.